Mirimar broke through for his first victory in Australia with a strong win in Wednesday’s Ladbrokes Multiverse Handicap (2400m) on the Hillside course at Sandown. Given the run of the race by Patrick Moloney, Mirimar raced in second place to the home turn where Moloney waited before challenging on the long run in. Mirimar accelerated into the lead 400m out then stayed on strongly to repel the challenges of Steel Prince and San Telmo to score by one length. Moloney said the win was as good as it looked. 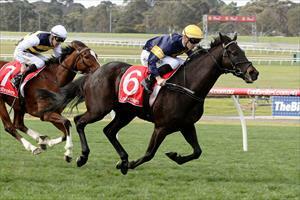 “The leader Darabad went off and set a solid pace and that suited us,” Moloney said. “He travelled well and I was just conscious of not getting there too soon but when I asked him for an effort he quickened up for me. Mirimar was purchased as a yearling in England by Paul Moroney on behalf of the Ballymore Downunder Syndicate. A winner with Ed Vaughan in England, Wednesday’s win was the first from four starts in Australia for the five-year-old son of Kalanisi. Congratulations to R & C Legh Racing Pty Ltd, Pulitano Thoroughbreds Pty Ltd, B & C Thoroughbreds Pty Ltd, Ms A M Bergin, Mr G J P Van Ameyden, Ms S J Nuttall, Mr I L Laughton, Mrs B E Laughton, Mr G J Sharp and Ballymore Stables (Aust) Pty Ltd.